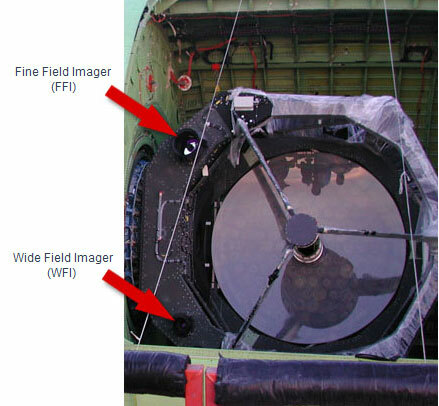 SOFIA has three acquisition/guider/tracking cameras, the Wide Field Imager (WFI), the Fine Field Imager (FFI),and the Focal Plane Imager Plus (FPI+), which are designed to determine where the telescope is pointed on the sky and provide telescope pointing corrections via optical tracking on guide stars. The WFI and FFI are mounted on the telescope head ring and can be seen in the photograph below. The FPI+ images the telescope focal plane via a dichroic and a second tertiary mirror. All three cameras operate at optical wavelengths. The properties of the imagers are given in the table below. The FFI and WFI use the same model Proscan "High Speed Slow-Scan" camera, containing a Thomson 7888A frame transfer CCD. During the Focal Plane Imager Upgrade in early 2013, the FPI+ camera has been replaced with a Andor iXon DU-888 camera with an E2V CCD201-20 EMCCD. With this upgrade, the FPI+ has a higher sensitivity, lower noise and faster readout speeds. An upgrade of the front-ring cameras FFI and WFI is currently under development. The basic (nominal) properties of the old and upgraded CCD are given in the table below. The imagers acquire star field frames and on-board control software correlates the star positions with star catalogues to determine the attitude of the telescope with respect to the sky. The guider camera images can also be captured during flight and saved as FITS files; they will be archived along with the science instrument data. The two image pairs shown here provide a comparison between images acquired with the WFI during tests in the summer of 2004 and star charts for the associated fields. For telescope diagnostic purposes and for science mission support it is possible to operate FPI+ from a dedicated laptop. When operated in this mode an additional 14-bit, 10 MHz readout rate is available as well as the readout of sub-frames which can increase the maximum frame rate to 400 frames per second (for science observations specifications, see the Observer's Handbook).